U.S. Army Special Operations in Afghanistan chronicles the "boots on the ground" actions by U.S. Army Special Operations Command (USASOC) from September 11, 2001, until May 15, 2002. 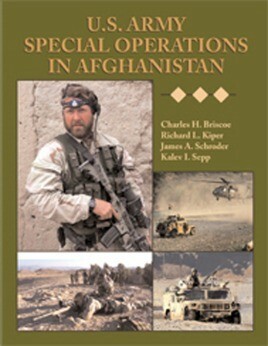 U.S. Army Special Operations in Afghanistan chronicles the "boots on the ground" actions by U.S. Army Special Operations Command (USASOC) from September 11, 2001, until May 15, 2002. What makes this book so significant is that the history was captured as USASOC troops (Green Berets, Rangers, PsyOps, SpecOps Aviation and Civil Affairs) were fighting the war, providing an easily understood snapshot of the war as it happened during those first critical months. The authors include the mistakes, frustrations and failures of the war along with the successes. Rather than an armchair historian's overall strategic view 10 years later, it is an account of what individuals and small teams did with bravery, skill and honour on a day-to-day basis to rid Afghanistan of the Taliban and al-Qaeda terrorists, and assist the Afghan people and begin the vital work of rebuilding the infrastructure of Afghanistan. Charles Briscoe is a retired airborne infantry and U.S. Army Special Forces officer. Richard Kiper served in Special Forces, airborne and infantry units stateside and overseas. James Schroder served in military intelligence, Special Forces and Special Operations aviation units. Kalev Sepp served in Special Forces, airborne, Ranger, artillery and armored cavalry units and on General Staffs in the United States and abroad.